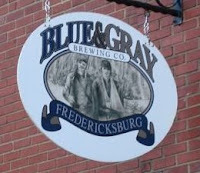 I stopped by the Blue & Gray Brewery this morning to pick up some beer for the weekend. I rarely visit the brewery on Saturday, instead I tend to go during the week. There was quite a crowd this morning. This was probably due to several factors in addition to today being Saturday. One, it's a holiday weekend. Secondly, Blue & Gray marks the unofficial start of Summer with the release of it's Virginia Hefeweizen, currently available in growler fills only. I have little doubt this release contributed to the crowds as I saw many growlers and beer bombs being filled with this golden brew. I did enjoy a small sample while I waited. The Hefeweizen will be available in bottles in a week or two and I'll post a full review soon. I stood in line for about 20 minutes waiting for my growler fill. Of course, the wait is no problem as free samples of the current Blue & Gray beers are freely available. It's fun to chat with other folks about the beers. It's also interesting, and sometimes humorous, to overhear comments from visitors on the tours. The best line today was from a lady who was getting a sample before going on the tour. She asked, "What do you have that's close to Bud Light?" That brought some good-natured replies from the crowd, "You can't get that here" or "Where's the water fountain?" Hey, at least she was there and willing to try something new. I've converted more than one factory beer drinker with Blue & Gray's beers, so there's a good chance she'll find something new to drink before the tour is over.